During my last stay at the Park Hyatt Tokyo, I received an upgrade to a Park King Suite. This review focuses exclusively on the suite. 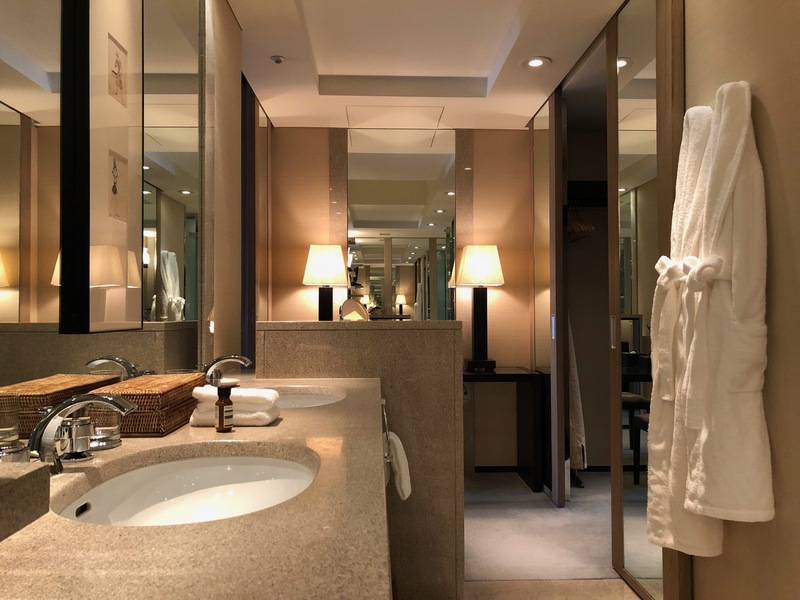 Yesterday, I provided a full review of the Park Hyatt Tokyo, its service, restaurant, and other amenities. That review also includes pictures from a standard room. As is often the case when checking in early, a suite is not yet vacant. Thankfully, most hotels, including the Park Hyatt Tokyo, proactively offer a standard room until the suite is ready. We had to wait until 5pm to check-in to this room, but it was worth the wait. First, I like how the Park Hyatt Tokyo still uses “real” keys. It’s old fashioned for sure, but I don’t mind it. Our 44th floor room included a living room, bedroom, and bathroom: a standard Park King Suite. Entering the room, the bathroom was on the left and living on the right. It was a beautiful day in Tokyo and the afternoon sunlight streamed through the windows. The living room featured a couch, two chairs, a coffee table, desk, and entertainment center. The entertainment center had a TV, Bose sound system (with iPhone plug-in), and a mini-bar with assorted alcohol, soft drinks, and snacks. I appreciated the fresh fruit juices available. The ice bucket had been replenished just before we moved in. Around the corner, the bedroom featured a king bed, second TV, and dressing table. Finally, the bathroom contained a tub, small shower, Toto toilet, single sink, dressing area, and walk-in closet. I actually liked the bathroom in the corner room better because it had a window over the bathtub with natural light. No guest bathroom in this suite. We hosted a meeting in our room, which we would not have done without the suite upgrade. While you’ll be just fine without a suite at this hotel, I certainly appreciated the upgrade. Looks nice, but dated. Just curious, do you share rooms with your business partner when traveling? I notice you refer to it as ‘our room’ etc. I do. We’ve been best friends for 20 years, we run a start-up and cannot justify separate rooms. What’s the price of the Yamazaki 12 in the minibar? It’s $42 for a pour of that here.